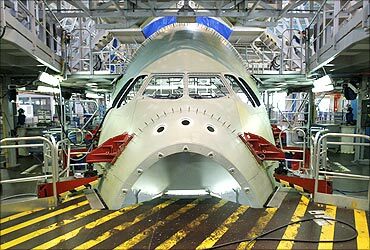 Rediff.com » Business » PHOTOS: How the giant Airbus is made! 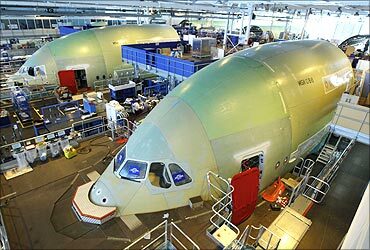 PHOTOS: How the giant Airbus is made! 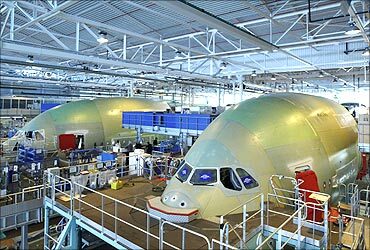 Airbus is the aircraft manufacturing arm of a European aerospace company, EADS. It is headquartered in Blagnac, near Toulouse in France. 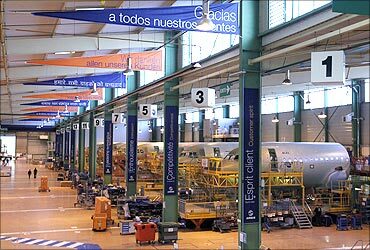 The aircraft maker began life as a consortium of aerospace manufacturers. Later it was jointly owned by EADS and BAE Systems. In 2003, however, BAE sold its 20 per cent holding in the company to EADS. The company has close to 57,000 employees, including in India. Airbus makes the first commercially viable fly-by-wire airplane, the Airbus A320. It also makes the world's largest passenger aircraft, the A380. 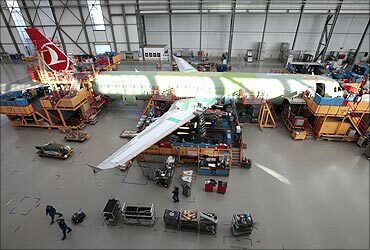 So check out how an Airbus is made . . . 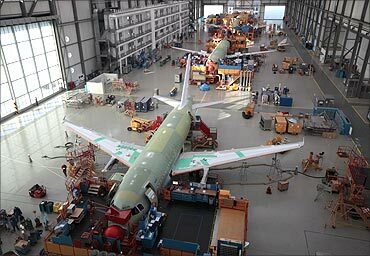 Image: General view of the Single Aisle A320 production line at the Airbus facility in Finkenwerder near Hamburg. 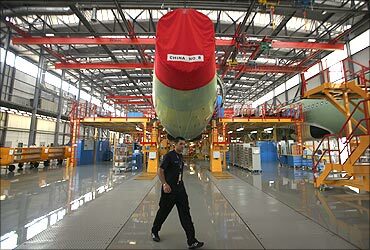 Airbus employees at the A320 production line at the aircraft maker's unit in Finkenwerder. 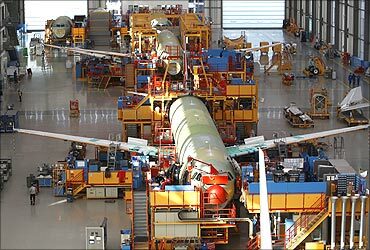 The Single Aisle A320 production line in Finkenwerder near Hamburg is where this modern aircraft is made. 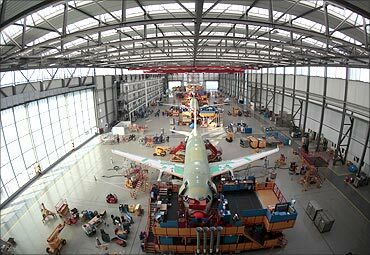 A couple of Airbus A320s sit inside the hangar at the Airbus facility in Hamburg, Germany. The cockpit section of an Airbus airplane is seen at the Airbus facility in Montoir-de-Bretagne near Saint-Nazaire. 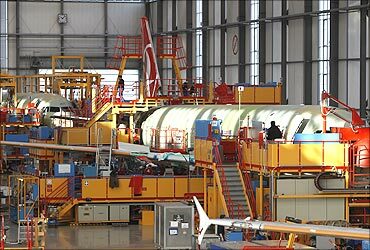 Airbus employees work in the fuselage section of an Airbus at the aircraft maker's facility in Montoir-de-Bretagne near Saint-Nazaire. 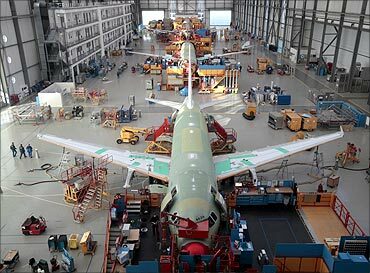 General view of fuselage sections of the A320 family of planes which are seen in a hangar at the Airbus facility in Montoir-de-Bretagne near Saint-Nazaire. 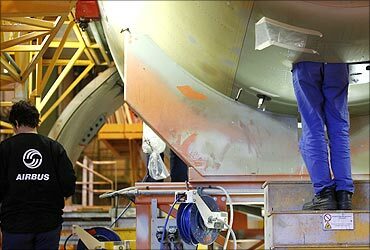 An Airbus employee works on a fuselage section of an A330 Airbus airplane at the Airbus facility in Montoir-de-Bretagne near Saint-Nazaire. Side view of the Airbus A320 at the Airbus hangar in Finkenwerder where the giant passenger plane is produced. 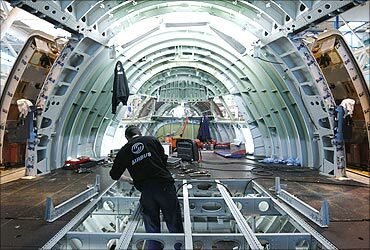 Inside the fuselage section of an Airbus airplane at the Airbus unit in Montoir-de-Bretagne near Saint-Nazaire in France. 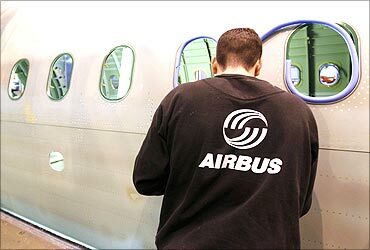 Airbus employees working on two Airbuses. An Airbus engineer checking out the miles of electrical wiring that goes into the making of an aircraft. 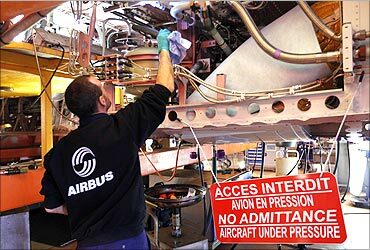 A technician working inside an Airbus at the EADS unit in Montoir-de-Bretagne near Saint-Nazaire in France. 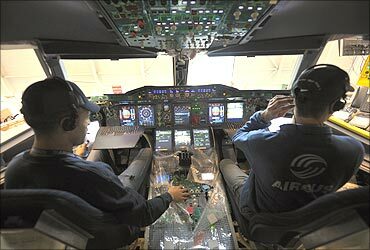 It takes thousands of hours of tedious and meticulous planning and monitoring to ensure that a high precision flying machine like the Airbus is entirely trouble-free. 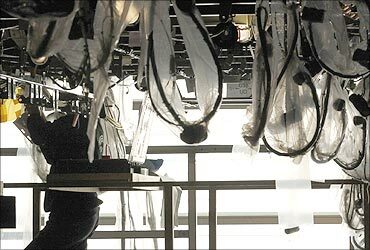 Workers check equipment in the cockpit of an Airbus on the production line at Airbus headquarters in Toulouse. A worker walks in front of a new A320 plane that is under construction at the Airbus factory located in the northern Chinese city of Tianjin. 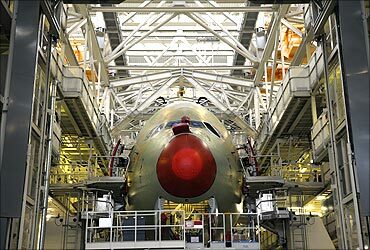 An Airbus A380 on the production line at Airbus headquarters in Toulouse. 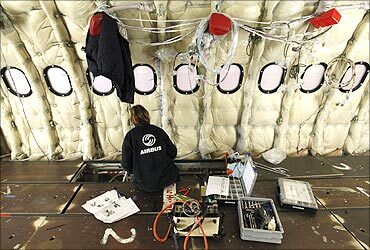 An Airbus employee works in the cockpit section of an A330 Airbus airplane at the Airbus facility in Montoir-de-Bretagne near Saint-Nazaire. 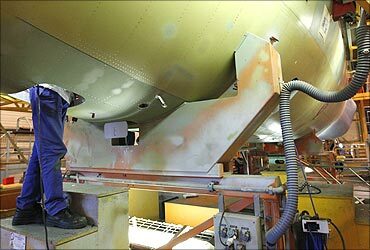 An Airbus employee works in the fuselage section of an A380 Airbus airplane at the Airbus facility in Montoir-de-Bretagne near Saint-Nazaire January 20. 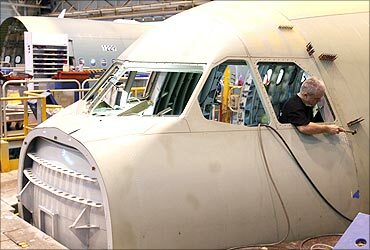 An Airbus employee checking the fuselage area of an Airbus A320. 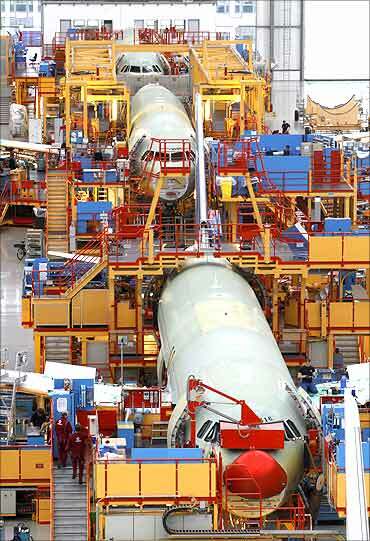 General view of the Single Aisle A320 production line at the Airbus facility in Finkenwerder near Hamburg. View of the hangar where three huge Airbuses are being assembled. How the Airbus is made! 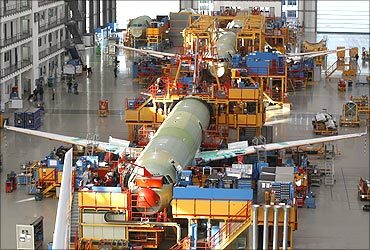 The Airbus A320 production line at the EADS unit in Finkenwerder near Hamburg.